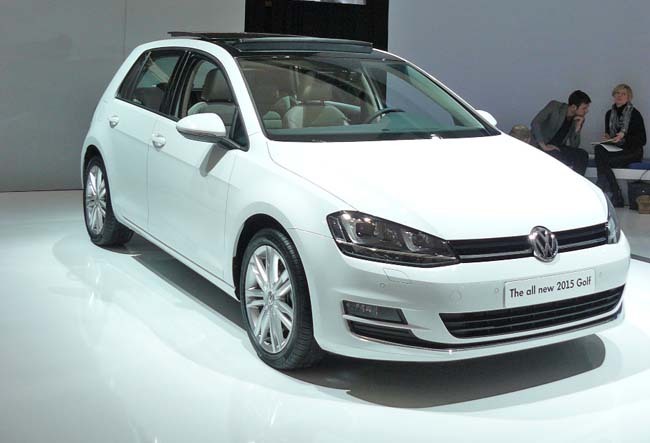 The 2015 Volkswagen Golf was unveiled to the Canadian public at the 2014 Toronto Auto Show. This version of the Golf is the seventh generation of the long running model by German car maker Volkswagen, or VW as it is affectionately known. Originally introduced in 1974 and marketed in North America originally as the Rabbit, the Golf platform has been one of the most popular cars ever sold worldwide. The new Golf is roughly 100 kilos lighter, yet larger than the model it replaces. The new platform has a wheelbase 59 mm longer, with an overall length that is 56 mm longer. The vehicle width has been made 13 mm wider. The roof-line is 28 mm lower than the outgoing model. Storage and interior room increases as a result of the larger footprint. The latest platform underpinning the new Golf is also shared with the latest Audi A3 as well as other models sold in Europe under other brands owned by the Volkswagen group. New for the 2015 model is an all-new 1.8 litre turbo-charged inline four cylinder engine. The new engine replaces the torquey but inefficient 2.5L inline 5 cylinder engine. Interestingly, the new 1.8L TFSI engine will match the larger, outgoing engine in horsepower, 170 HP, but produce even more torque. It will produce a total of 184 lb-ft of torque, yet provide upwards of 15% more fuel economy. Although this is an all-new model to North America, journalists originally drove this latest Golf back in 2012. It went on sale in Europe later that year. A whole slew of variants such as diesel engined models, GTI performance editions and even a Golf R, have been confirmed and even shown at other auto shows. Despite being omnipresent at auto shows over the last 2 years, the latest Golf has yet to make an appearance in North American showrooms. Pricing has not been confirmed but the new Golf is scheduled to hit Canadian showrooms later this spring.